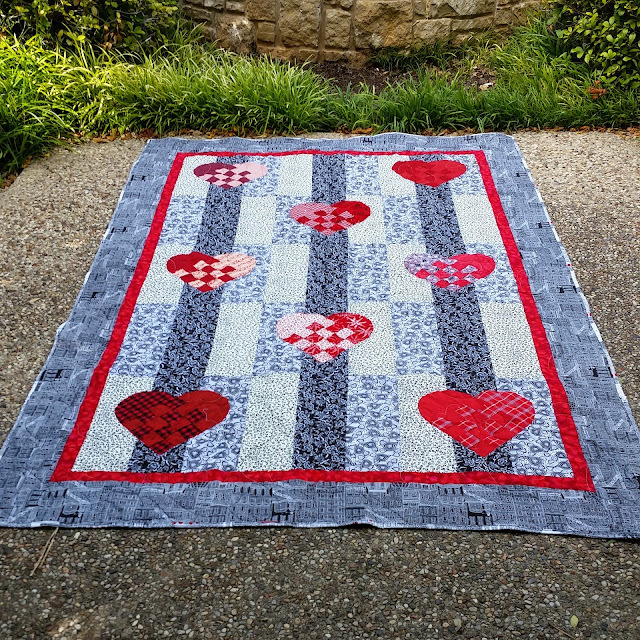 I just heard about a fantastic linkup over at Sew Mama Sew where you can share your favorite quilt. Today is the last day so I'm really glad I caught it!! But when I thought about my favorite quilt, this is the first one that popped into my mind. I finished this quilt years ago, back when I first really got into quilting. There are many imperfections, but that doesn't erase the special memories that are in this one. You see, I finished piecing the top for this quilt the day my grandmother died. I was crying as the last stitches went into it. There couldn't have been a more perfect quilt to be working on that day. I had already worked a lot of memories into it. Below is a closeup of one of the woven hearts. The plaid is from a shirt my middle child used to wear when he was about 6. The roses are from a corduroy jumper my daughter used to wear when she was 2 or 3. My niece had a matching jumper. Those kids are now 21, 17, and 17 respectively. You see the plaid in this one??? That is from a shirt my ex mother-in-law used to put on my boys when they would get cold. She'd put them in it, button it up, roll up the sleeves, and off they'd run, with it dragging on the floor behind them. They were so little at the time! The boys are now 25 and 21. This plaid is another one of my middle son's shirts. He was much younger with this one. Maybe 3? I have pictures somewhere of him wearing it riding the little kiddie rides at the rodeo. Not to mention the fabric. I love this border fabric. I have tons of it left and it just adds so much to the quilt. The backing has this fantastic cityscape. Again, one of my favorites and I have a ton left. It will make another appearance someday. I was such a new quilter, and learning as I went. From this project, I learned that I need to fuse down my pieces to add stability to my applique. 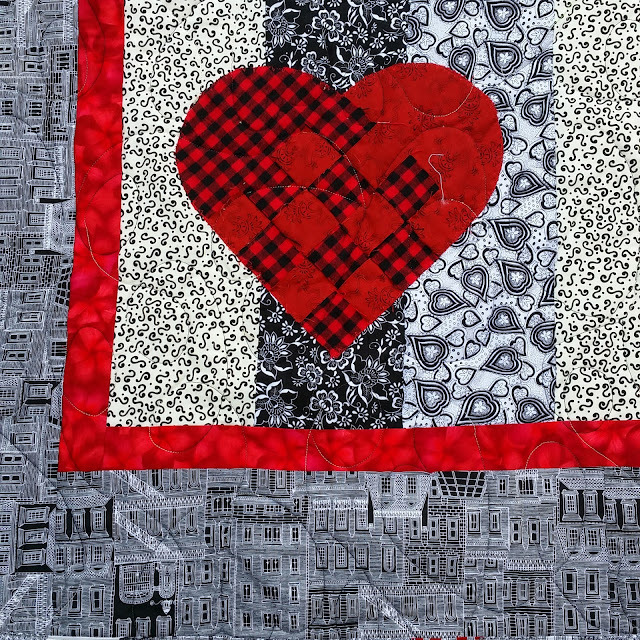 I'm scared to use this quilt because the hearts are so delicately attached. I'll figure out the best way to fix that someday. But no matter what, I don't think any other quilt I finish will take the place of this one as "My Favorite Quilt." 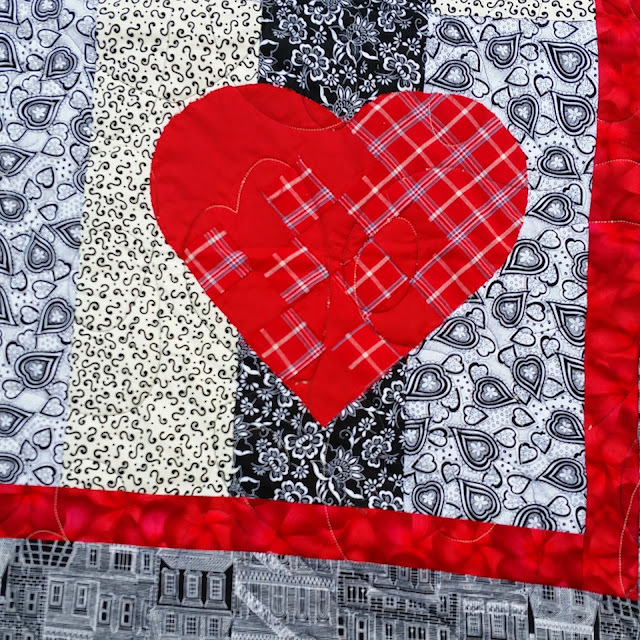 Linking to Quilt Story and My Quilt Infatuation..
And to Val's Quilting Studio for Tuesday Archives. I love this quilt. The black and red are perfect together. The woven heart is wonderful. You did a fantastic job on your first quilt. Thank you for sharing your reflections as you made this quilt. Lovely memories! And, you did a great job using these remnants in a meaningful way that is very much what our grandmothers did as they used everything for a purpose and a reason. 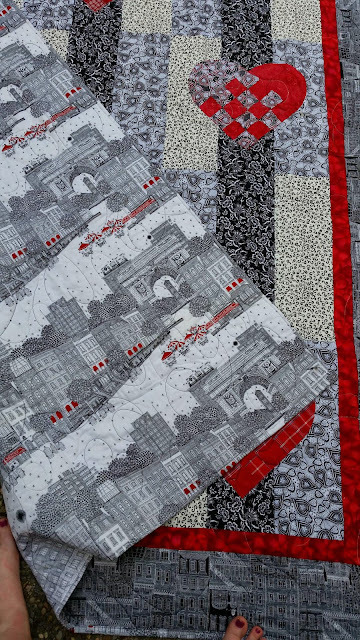 This is a pretty quilt with the red, black, grey colors. Great quilt with a great story. 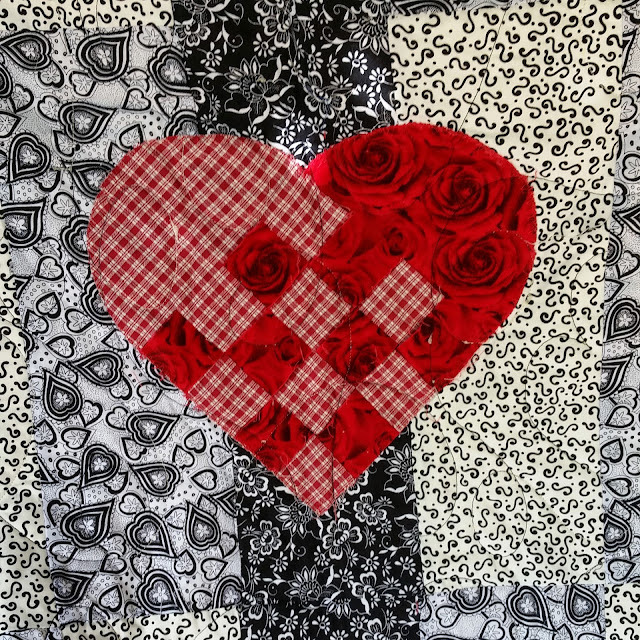 This is what quilting is all about! What a great quilt and memory.